What are the deadlines if I am filing an appeal for a denied social security claim? If you applied for disability benefits from the Social Security Administration (SSA), and you’ve received a notice of denial, you have 60 days to appeal the denial. This means you must get your appeal on record with the SSA within 60 days from the date stamped on the envelope of the denial letter. There are multiple levels of appeal, and because the process can be complex and time-consuming, it’s important to hire an experienced SS disability attorney who can assist you with a denied claim, regardless of what level you are in the process. In the appeals process, there are various levels of appeal: reconsideration, hearing by an administrative law judge, review by the Appeals Council, and filing a lawsuit with the Federal District Court. However, no matter what level your appeal is in right now, you always have 60 days to file your next appeal. Usually, individuals filing claims get an extra five days to ensure their appeal gets through the mail process and reaches the SSA by the deadline. However, the SSA doesn’t go out of its way to communicate this additional time. 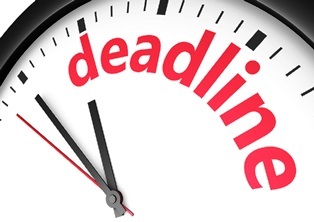 To meet the deadline, the SSA must receive your appeal paperwork by the deadline date. This does not mean your paperwork must be postmarked by the deadline date; rather, it must reach the SSA by the date. Because neither you nor the SSA has any control over the speed of the mail or if your appeal might get hung up in transit, you need to get your disability appeal paperwork mailed to the SSA as soon as you get your denial letter. Don’t assume because you’ve hired a lawyer, you can forget about these deadlines or that your lawyer will also receive a denial letter from the SSA. While the SSA sends a copy of the denial letter to both you and your lawyer, it’s possible the agency might fail to send a copy to you both. When you receive a denial letter, you should immediately contact your attorney to ensure that the appeals deadline doesn't get overlooked. If you need help with the appeals process after your claim is denied, call Cuddigan Law. We’ve assisted thousands of clients with this process by filling out their paperwork, collecting their medical records, calling doctors, and managing the appeals process through each of the four levels. Having an attorney on your side can ensure you don’t miss any deadline in this process. Contact us for a free evaluation. We’ll review your case and let you know how we can increase your chances of receiving an approval on your appeal. ?How does the SSA evaluate my job history for a disability claim?